Today was a great day to hang out indoors. So it was lucky that I spent all day in a classroom taking an Adobe Lightroom 3 seminar through Blueridge Workshops. As I was driving home around 6 p.m., though, I could see storm clouds building in the west. By the time I got to Middleburg, it was clear that I wasn’t going to make it home in time to avoid the impending thunderstorm. 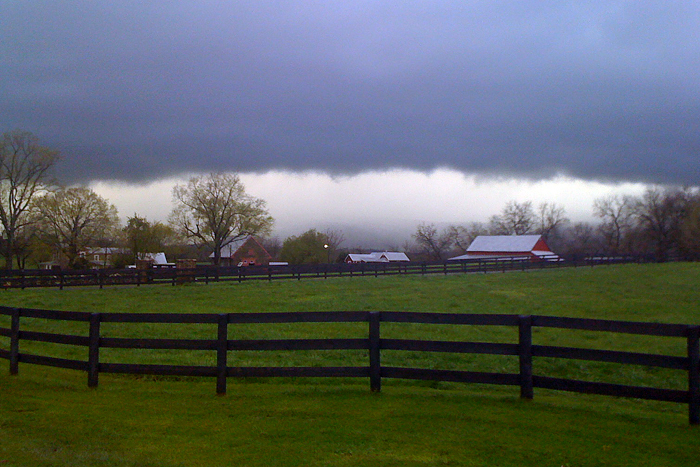 But as I approached Upperville, the storm was over the mountain ridge, and the cloud formations were amazing, with lightning bolts striking all along the ridge top. How ironic was it that I was driving home from a photography seminar without a camera? Well, being a class on software we didn’t need our cameras. Thankfully, though, there’s always the trusty iPhone, so I pulled off the side of Route 50 just before the torrents of rain began. No, it’s not the best photo, but sometimes even a snapshot can tell a story.